Jon 'maddog' Hall has headed nonprofit organisation Linux International since 1994. A proponent of free and open source software (FOSS) since his university days in the 70s, he now spends his time promoting the Linux operating system, consulting, and working with various groups promoting FOSS. Some say his expertise on the Penguin-themed platform is matched only by his vast Star Trek knowledge. Hall recently spent time in London to make preparations for Campus Party, a technology event taking place at the O2 arena in September. 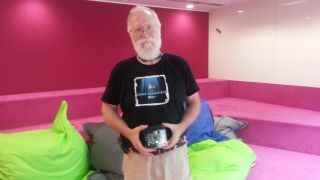 We caught up with him to chat about his love for open source software, the future of Linux, and why he's excited about Google Glass. TechRadar: Hi maddog. How did you get your name? Jon 'maddog' Hall: At the age of 27 I had to learn to control my temper, which I lost quite a bit. In some cases I was proud of it, but I had an incident at one time that convinced me that losing your temper is a way of losing an argument. Everybody but my mother called me maddog. She died about two years ago aged 89, and now that's what everybody calls me. I still have the temper, and I still get angry, in particular at people that do or say stupid things. But I've learned to control and channel that. It's also a lot easier because if somebody yells "Jon" at you down the street, 20 people turn around. If you hear "maddog", it's usually for me. TR: Things have been a bit quiet on the Linux International front recently. What's happening there? JH: Linux International has come down to me going around talking to various organisations and working with groups like Campus Party to promote open source. I had an idea recently for reanimating Linux International as an end-user organisation as there's always this conflict between an organisation that represents companies versus one that represents the consumer. However, you need a certain number of people to sustain an organisation, or you get stuck where Linux International was, which is where you have a small amount of revenue you can't really do anything with. TR: How are preparations going for this year's Campus Party? JH: Good. We're going to Cambridge University soon to bring some stuff back for it. You're probably aware of the fact they invented the EDSAC computer and did a lot of work on Xen. They also did the Raspberry Pi, which is how I linked up with them in the first place. I'm also going to Bletchley Park where I'm hoping to get some stuff on Alan Turing and cryptography. The National Computer Museum's there too, so I'm also going to look at the Colossus computer and parallel computing. TR: Do you think it's important that people know about such things? JH: It's amazing the number of people who don't know the history of that. They may have heard that Bletchley Park did something about coding, and that Alan Turing did something, but they don't really know anything about the University of Cambridge, which is one of those things people call a 'crime against God'. I go around the world talking to countries that for some reason think computer science has to come from Silicon Valley, or Seattle or Washington, which isn't true. It's logic, ones and zeros that you should be able to do anywhere. Free and open source software allows people to take that jump step. You don't have to go back to the days of when I started out, where a computer only ran one program at a time. In the headquarters of the Nobel foundation, they have quotes from different businesses and philosophers. I think it was Newton who said "I stand on the shoulders of giants", and that's what free software allows you to do. It allows you to stand on the shoulders of giants.